The Silver Beaver is the highest honor that any Boy Scout Council can bestow on an adult volunteer. Instituted in 1931, it is awarded "for noteworthy service of exceptional character to youth by registered Cub Scouters, Scouters, Varsity Scouters, and Venturing Leaders within the territory under the jurisdiction of a local council." 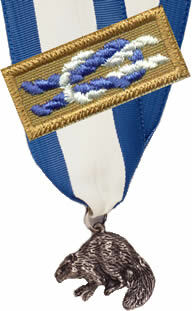 Candidates are nominated by other Scouters, selected by a committee of previous recipients, and approved by the National Council, Boy Scouts of America. The Awards are presented each January at the Council's Annual Awards Dinner. Nominations for future recipients on a standard form are due at the Council Office on or about December 1 each year. The form should be completed with examples of leadership and service to youth that meets the criteria for selection. The nominee should not be told of his/her nomination as the Council can only select a limited number (currently 4) annually based on the number of registered units within the Council. After the Selection Committee has met and the National Office has approved the nomination, the Council will make an announcement of selected individuals. * = deceased; Please let the Council Office know when any prior recipient has passed away. 1982 Karl N. Haws Kent C.Humpherys Frank J. Johnston, Jr.
1986 Edmund A. Barbeau Sheila Braithwaite Elmer L. Jones, Jr.
1991 Jerry Bowman Ortwin Holdt * C. Richard James, Jr. Note: Recipients which have a "+" next to their name received the Silver Fawn Award, the female equivalent during much of the 1970's. All information on this page is updated and maintained by the Council Training Chairman. If you need to report improper information, broken links, etc, please contact Larry Basham at drbuzz2@aol.com.